Implants Dental Solution For Failed Root Canal Treatment. Dental implants are root devices usually made from titanium that dentists use to support restorations like crowns, bridges or dentures. 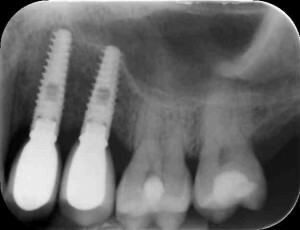 An implant is placed during a minor operation which is either carried out under local anesthetic or sedation. Dental implants are gently implanted into the jaw bone and left for a period of 3-6 months. 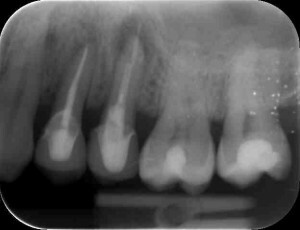 During this healing time the dental implant actually bonds with a patient’s bone; in fact often times more securely than a natural root. 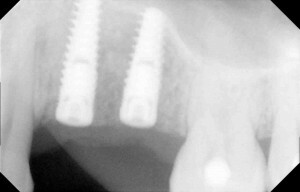 After the healing period, impressions are taken of the dental implant and a dental crown or dental bridge is made that is attached to the dental implant. Dental implants are an ideal option for people in good health who have lost one or more teeth due various reasons, such as periodontal disease, injury or normal wear and tear. The purpose of dental implantation is to replace missing teeth and it is an excellent option any time after adolescence when bone growth is complete. Certain medical conditions, such as active diabetes, cancer or periodontal disease may require additional treatment before the dental surgeon can perform the implant procedure. Even though this will add up to the total costs, it is an important step in the process, because it will ensure patients get the best results when the dental implants are placed. The Brighton Implant Clinic provides literature and other forms of resource materials on dental implants. These materials explain the dental implant procedure, side effects, costs, benefits and the chances of success or failure. A dental implant designed to replace a single tooth is composed of three parts: the titanium implant that fuses with the jawbone; the abutment that fits over the portion of the implant protruding from the gum line and the crown. Dental implants are made of titanium and have shown to be very well accepted by the bone and gum tissues. If you have lost teeth due to various reasons, dental implants are the most viable option, because they function naturally and are durable, often lasting for a lifetime.